It’s a great place to people-watch, and to grab lunch when you and your dining companions may be craving radically different things. Just tote it all to a nearby table to dig in. 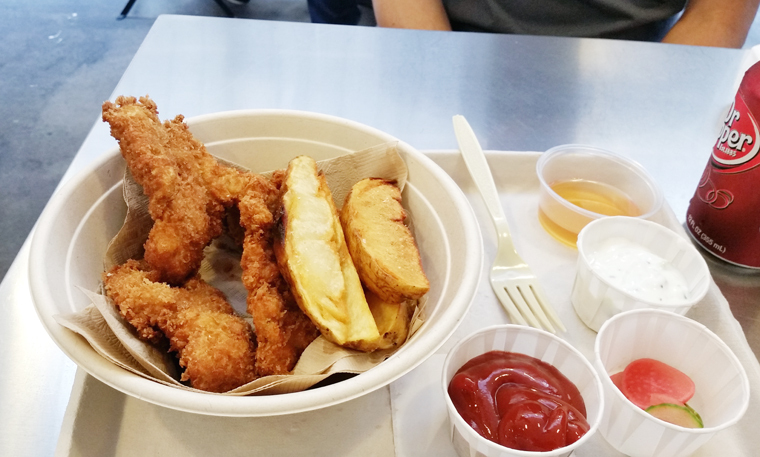 My husband opted for a special of fried chicken and steak fries at Bombo. The juicy thigh meat was dredged in panko, giving it a light yet exceptionally crisp crust. Because it was boneless, it was easy to pick up and eat. Alongside was malt vinegar, tartar sauce and some house-made pickles. Octopus ceviche at La Tostaderia. 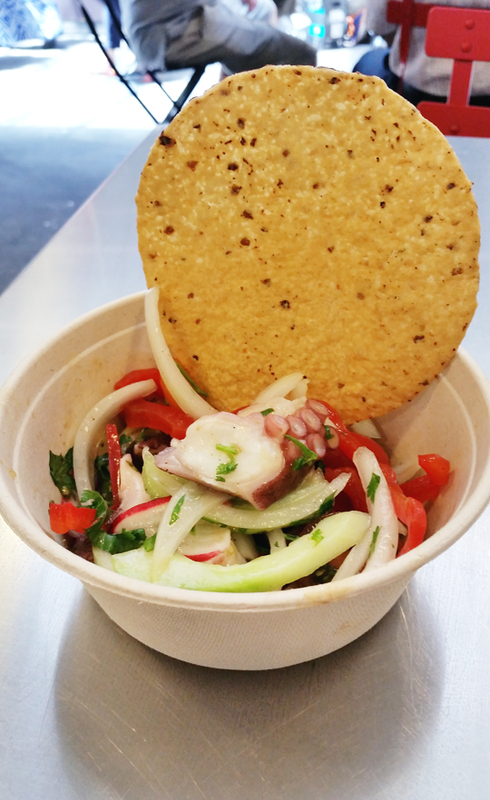 Meantime, I walked over to La Tostaderia, which specializes in ceviche to order an octopus tostada ($8). The octopus was poached in sake, leaving it very tender, then chilled and mixed with a refreshing, spicy blend of onions, tomatoes, habanero, cilantro and anchovies. On my way back to the table where my husband sat, I couldn’t help but stop at Valerie, a scrumptious looking bakery stand. 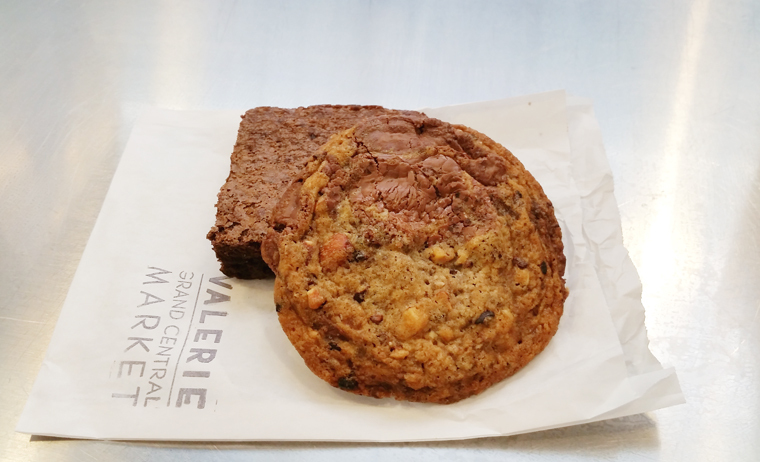 I snagged a milk chocolate-y, chewy Durango cookie made with almonds, cocoa nibs and a dusting of Durango hickory smoked salt; plus a fudge-y brownie infused with mole, leaving it tender and earthy-sweet ($6.25 for both). Of course, what I really wanted was one of their magnificent, towering coffee crunch cakes. Yes, modeled after the original one at Blum’s. Next time, I plan on buying an entire one, and just diving into it at the table. Places like Chef Andy Ricker’s Pok Pok Phat Thai are making Chinatown hip again. 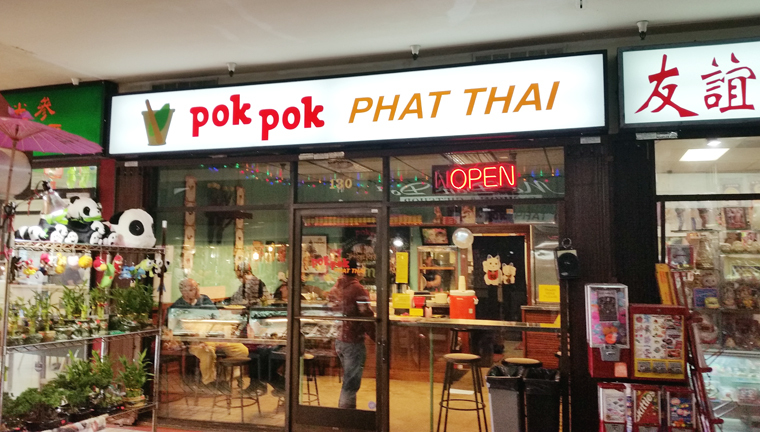 Tucked away in a mart full of mom-and-pop eateries and tchotchke stands, Pok Pok Phat Thai is teeny-tiny. Step up to the counter, where, if you’re lucky a cute worker who looks like Keanu Reeves’ younger brother will take your order. Andy Ricker’s first Los Angeles eatery. Once you get your food, you can customize it with containers of fish sauce, sugar, chili powder and chili-spiked vinegar. 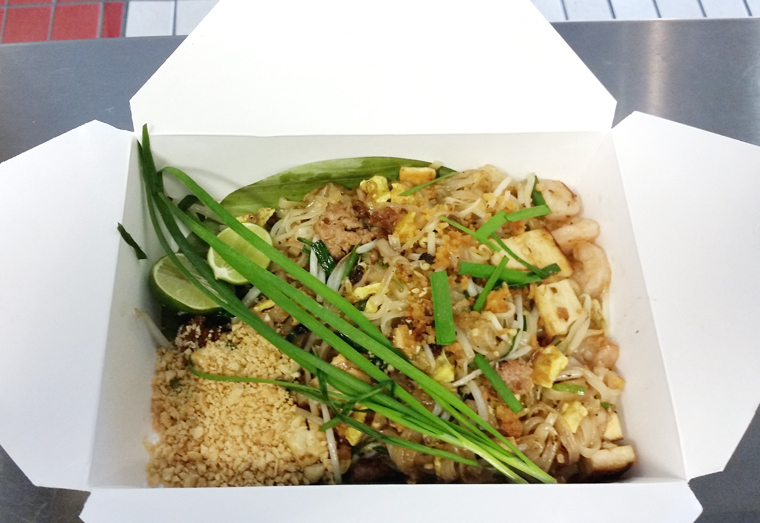 The Phat Thai Ruam ($11.50) is a combo, allowing you to enjoy thin rice noodles cooked in pork fat with both prawns and pork. The half and half combo. What you’ll notice immediately about this pad thai is that it’s not tinted red nor achingly sweet like so many Americanized versions now are. Instead, you taste the pungent dried shrimp, garlic chives, fish sauce and just enough tamarind to lend a fruity-sourness. The Kuaytiaw Khua Kai ($9) is a mix of locally made wide rice noodles stir-fried in more pork fat with chicken, cuttlefish, egg and green onions. The noodles are like a flatter version of chow fun — soft and chewy. 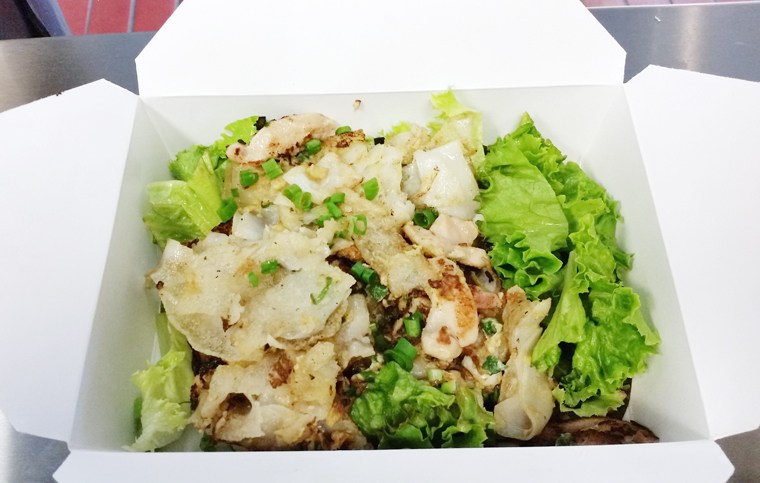 They’re served over a mound of chopped lettuce to add a fresh, crisp element. The Larder is award-winning Chef Suzanne Goin’s newest venture, so I knew it had to be worth checking out. 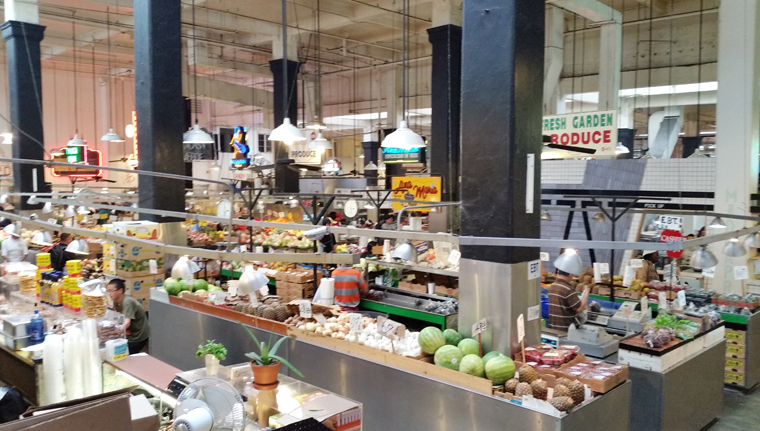 It’s both a retail and commercial bakery that’s grown in only a few years to four locations in Los Angeles. 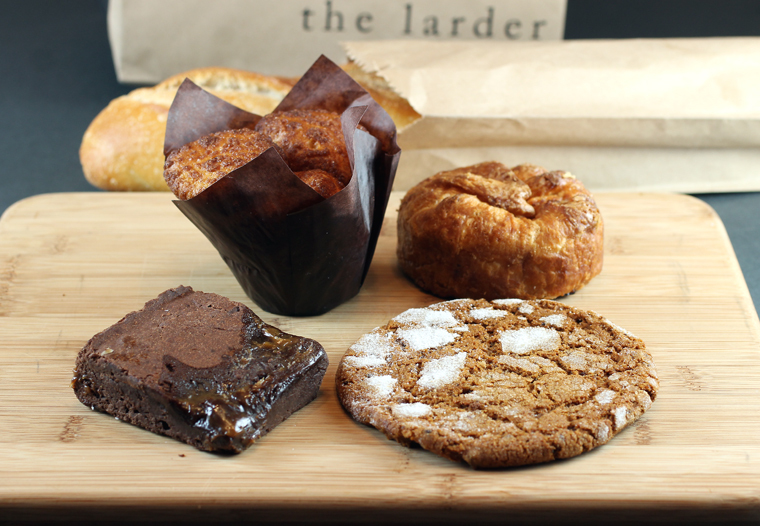 Heavenly treats from the Larder. In fact, it was my last stop, before we drove back to the Bay Area. So, I gleefully loaded up the backseat of the car with a baguette (heavier in texture than the traditional French one); an ooey-gooey salted caramel brownie; a monkey bread with the soft texture of coffee cake and a dusting of cinnamon almost as spicy as a Red Hot; a glorious Nutter Butter thick cookie sandwich rolled in chopped peanuts; a walnut bundle pastry with a hidden interior of creamy walnut paste; and a big cinnamon molasses cookie. It all definitely made the drive home go faster. There seem to be great donuts all over the country lately. A movement I support! Loads of good things to explore next time I’m in LA — thanks! Carolyn, thanks for sharing your LA tips. Every time I go I feel a bit lost and know I’m missing out on all kinds of goodness. I could go for a bowl of that octopus ceviche right now! Wow, everything looks amazing! 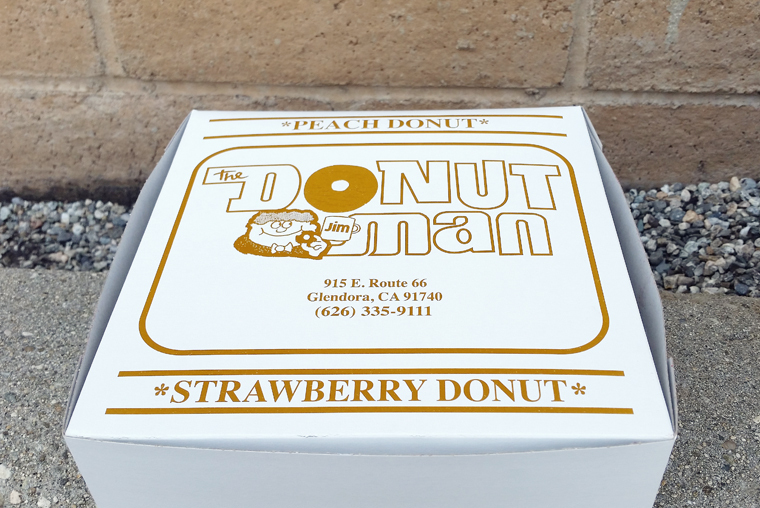 From the strawberry donut to the treats from Larder, you really made the most of your visit to La La Land! OMG. 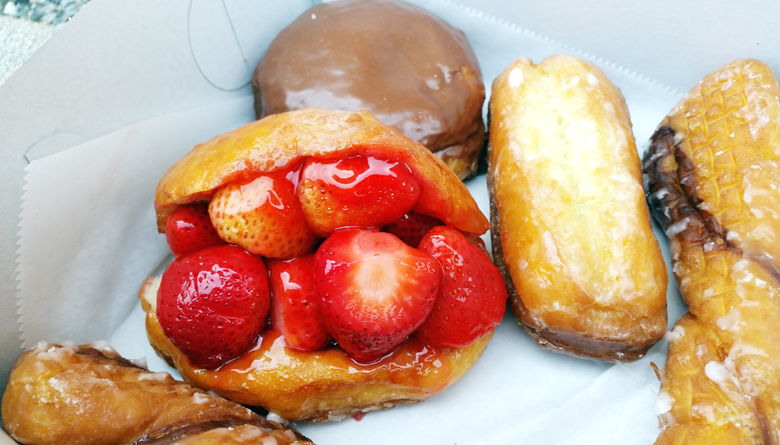 That strawberry donut!! And I had no idea Valerie had a bakery there. I love their toffee!! And they have the Blum cake too?! Carroll: You must make a pit stop there to get a donut. They might even be serving the fresh peach donuts by then, too. So worth the detour.